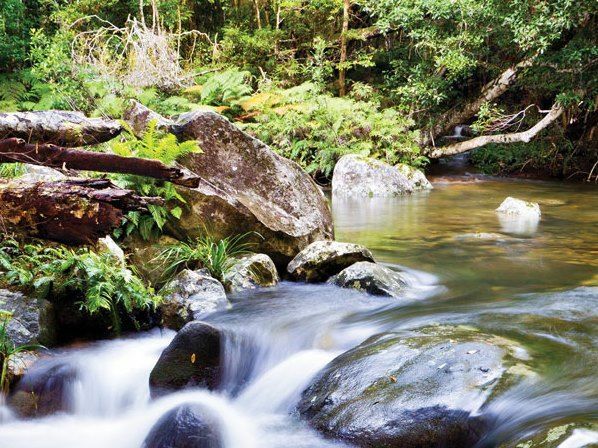 Washpool National Park, north-west of Grafton or east of Glen Innes, offers wilderness walks and camping in stunning World Heritage surrounds. Take time out to explore the unparalleled landscapes of Washpool National Park, a place of steep gorges, clear waters and magnificent tracts of ancient rainforest. You’ll find some of the most varied and least-disturbed forest in NSW, including the world’s largest stand of coachwood trees and extraordinary specimens of giant red cedar. Washpool and adjacent Gibraltar Range National Park are part of the Gondwana Rainforests of Australia World Heritage Area, and offers wonderful wilderness walks lasting half an hour to several days, along with simple, miles-from-care camping and picnicking opportunities in gorgeous surrounds. It’s also a natural haven for an incredible diversity of plants, mammals, amphibians, reptiles and birds, including some of Australia’s rarest and most unusual creatures, like the once thought to be extinct parma wallaby, the pouched frog, the long-nosed potoroo, and the beautiful, cat-like spotted-tailed quoll. Birdwatchers will be in their element here – more than 140 species have been recorded, including the rufous scrub bird and the increasingly rare powerful owl.